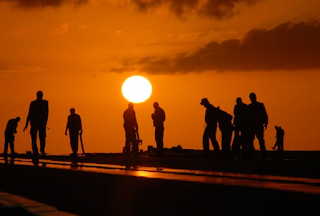 prevent heat illnesses on the job this summer. This summer, OSHA is reminding all employers and workers to take precaution against heat illnesses. With a brutal heatwave sweeping the northern hemisphere, it's important for anyone working in a labor-intensive field to brush up on heat illness facts to prevent accidents before they happen. The reminder comes directly from several state OSHA programs. In sunny states such as California, the local OSHA program reiterates the importance of common heat safety protocol. However, some surprising states such as Oregon are emphasizing the risk of heat illness. In typically colder states, workers may not be accustomed to working in warm temperatures, putting them at a higher risk for heat stroke and heat sickness. "Prevention really comes down to taking several important precautions," Penny Wolf-McCormick, health enforcement manager for the Oregon OSHA branch, said in a recent press release. Heat illnesses cover a range of disorders due to exposure to heat. These can include heat stroke, heat exhaustion, heat rash and heat syncope. Symptoms of heat illness include dizziness, nausea, confusion, dry skin, and an abnormally rapid pulse. If left untreated, people can die from certain heat illnesses such as heat stroke. Working long hours of strenuous tasks in heavy protective gear only increases the risk of injury. However, it is possible to prevent heat illness with proper safety. Perform the heaviest, most labor-intensive work during the coolest part of the day. Use the buddy system (work in pairs) to monitor the heat. Drink plenty of cool water- aim for one small cup every 20 minutes. Water light, loose-fitting, and breathable clothing. Take frequent short breaks in cool, shaded areas - allow your body to cool down. Avoid caffeine and alcoholic beverages - they can dehydrate the body and increase the risk of heat illnesses. Move them to a cool, shaded area but do not leave them alone. Provide cool water to drink. Try to cool them by fanning them, spraying them with a cool mist of water or applying a cold, wet cloth. If they do not feel better in a few minutes, call 911 for emergency services. To learn more about the OSHA standards for occupational heat exposure, visit their website. To learn more about OSHA training, visit Zack Academy.